The third annual Cinciditarod will hit downtown Cincinnati on Saturday, March 6 and officially opens registration today. The popular race is based off of the famous 1,100-mile Iditarod dog-sled race in Alaska. The Cincinnati version instead includes teams of people racing through Cincinnati's center city in decorated shopping carts. Over the nearly five-mile course teams are instructed to pick up items on a grocery list and must stop at five mandatory check points where a team challenge awaits them. Registration is open now through Friday, February 26 and teams must consist of five people over the age of 21. The registration form can be downloaded online and is $30. The grocery items collected during the race will go to benefit the Freestore Foodbank. 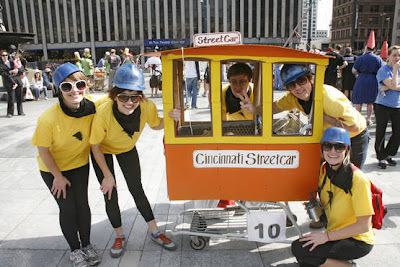 Cincinnati Streetcar Cinciditarod team photo from CincyCoolness.